During a short vacation up north we visited several Costcos along the way. I spied the object of today's review at their Santa Maria location and thought about buying it but passed. After we left, even though I'd never heard of Toretti's Family Vineyard, I kept thinking I should have bought it because it seemed interesting. Don't ask me why some wines look more interesting than others; they just do. Well, I was redeemed with a second chance at the Goleta Costco. That same wine was sitting there in the bin. There was another bottle that looked interesting too. Being that I had already bought some bottles earlier, I decided I would just get one. I asked the guy in charge of the wine department which one he would recommend, saying I was looking for a more Burgundian style. Without hesitation he pointed to the Toretti bottle, telling me it was a good one. Not one of those overblown fruit bombs. So without hesitation I purchased it. This was back in May. The other day I popped it open. Good recommendation! This is one mighty fine Pinot Noir that has plenty of varietal character. 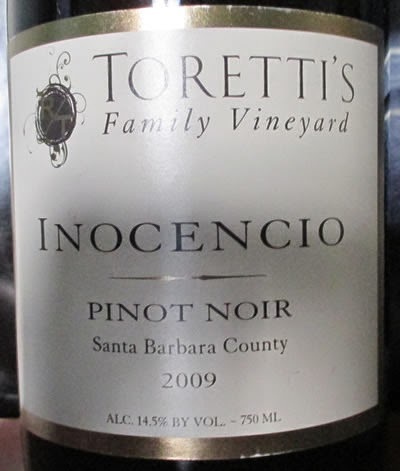 I guess I ought to specifically identify it - the Toretti's Family Vineyard Pinot Noir Inocencio Pinot Noir, 2009, Santa Barbara County (there's a picture of the label below). I sensed it was going to be good when I saw the color - very light, somewhat translucent, like a Pinot Noir ought to look, rather than those opaque things that California likes to produce. The aromas - like the title of this post says, wowzers. It had that barnyard funk but very well integrated with strawberries and other red berries and an earthy character. I just loved swirling the glass and waving it under my nose. The promise of the color and the aromas followed through to the palate. Nicely concentrated flavor, great backing acidity and a long, sort of peach pit minerally aftertaste made this all in all one really nice wine. The good thing is I am writing this after only consuming the first 1/4 of the bottle so I have my three 187 ml shares left to enjoy. Of course the wine could just fade away over the next three days but I doubt it. I got so excited about how good of a Pinot Noir this was that I had to write about it right away. The good part: it was $18.99 at Costco, a total bargain for a Pinot Noir of this quality. I don't know if they have any left. It is still available from the winery but there it is $44.00. Is it worth $44.00? Given what wines of this quality and character cost these days, especially from smaller producers, my answer is yes, it is. The Costco price was just a very fortunate bargain for me but this wine is worth what the Toretti family is pricing it for on their site. This is a darn good wine and it has the acidity and balance to last longer but it sure is good now.